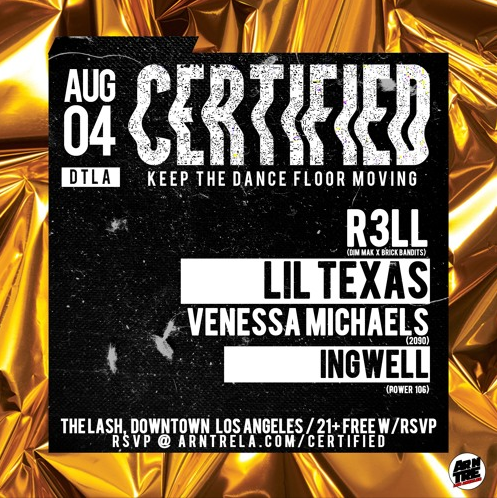 LA Scene: Certified ft. R3LL, Vanessa Michaels, & Lil Texas[/caption] Los Angeles has one of the most vibrant music scenes on Earth. On any given night there are countless venues and different parties going on throughout the city, and it's virtually impossible to find an event that didn't have a style or genre you were currently into. Los Angeles really has a very democratized electronic music scene in particular. There are tons of new artists and events coming through the scene; which makes the City of Angels, also The City of the Underground music scene. A new Club music event called Certified has sprung out of Los Angeles to give Jersey Club a new forum in Los Angeles. Certified is the latest project by recent New Jersey Transplant, R3LL . The inaugural event was held at The Lash in Downtown Los Angeles; A hotspot for underground music and alternative nights that feature two dance rooms, two bars, and outdoor smoking area. The night was filled with club music and Hip Hop curated by upcoming acts in the Club/Bass music scene. The lineup featured acts such as Lil Texas, Vanessa Michaels, and R3LL. Vanessa Michaels dropped one of the most lit sets (In My Opinion) and elevated the party to a new level. The event was a successful night with sweaty bodies riding the wave of club music being played. We can only expect more from R3LL and the ARNTRE family.